Osteoporosis (or bone loss) is one of the biggest health problems that older people face. And one of the biggest fears associated with osteoporosis is a hip fracture. As fractures in old age heal very slowly, or not at all in some cases, a hip fracture is often regarded as a one-way ticket to a nursing home. There are many ways that you can help prevent and even reverse bone loss. Usually, weight-bearing exercise is recommended for increasing bone density. In weight-bearing exercises, you are supporting your own body weight using your feet and legs—jogging, running, walking, and jumping are good examples. These activities increase bone density by having the muscle pull on the bone through impact on the ground and from carrying your body weight. The reason for this study was that, while high-impact and mechanical loading have been linked to increased bone density, these types of exercises may not always be appropriate for middle-aged and older adults who are (a) not at their physical best and (b) usually suffer from conditions like osteoarthritis or some sort of degenerative muscle disease. 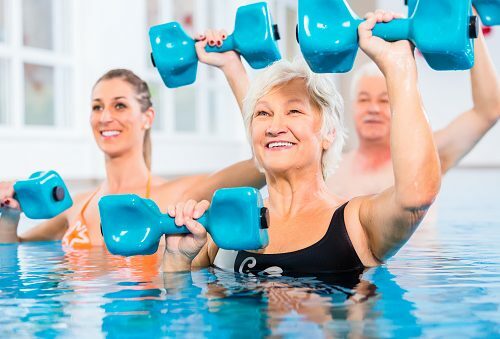 The objective of the study was to see if water-based exercises could be effective in preventing age-related bone deterioration in middle-aged and older adults. As part of the study, the researchers used relevant databases and conducted a string of critical narrative synthesis and meta-analyses from 12 studies involving 629 participants. Of the twelve studies, eight studies compared participants in the water-based exercise group to the sedentary control group, and four studies compared the water-based exercise group to the participants in the land-based exercise group. At the end of the study, the researchers found that the participants in the water-based exercise group showed better bone mineral density at the lumbar spine and the neck of the femur (thigh bone) compared to the sedentary control group. While the participants in the land-based exercise group showed better bone mineral density in the lumbar spine, the neck of femur showed no significant difference in both the groups. From this study, it becomes clear that while land-based exercises are better than water-based exercises in helping prevent bone loss, for people who cannot do land-based exercises, the water-based exercises are a great option. So go ahead and make a splash.